Britain is rich in sporting heroes in bronze - sporting figures (men, women and animals) celebrated in sculptures around the country. These 'sporting immortals' are the focus of this site. This kaleidoscope of heroes and memories provides a fascinating and vivid view of the history of British sport. Divided into eras of our sporting history, this site illustrates a selection of six to eight sporting immortals from each era - with colourful photographs of each. 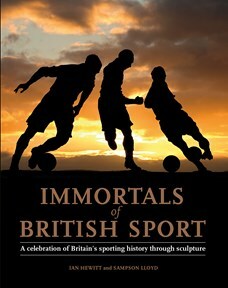 Many more appear, with extended text, in a new, 320 page, fully illustrated book titled Immortals of British Sport: A celebration of Britain's sporting history through sculpture. Click below on a particular era of British sport. An introduction will set the scene together with a group of sporting immortals from that period. Click on the selected sporting figure. Vivid photographs of a statue or memorial of that hero will appear.